Gulkand (lit. Rose-sugar in Arabic) is an Ayurvedic tonic prepared from rose petals. 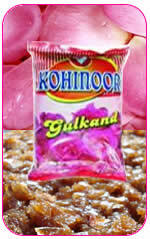 Gulkand is undoubtedly the most delicious Ayurvedic preparation known to mankind. It is made primarily of rose petals which are collected at their peak condition. Gulkand has been traditionally used as a cooling tonic to combat fatigue, lethary, mucular aches, biliousness itching, and heat-related conditions. 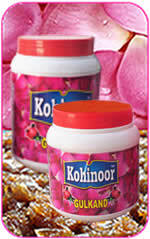 It is good for memory, eyesight, cheerfulness and it is a good blood purifier. It is also naturally rich in calcium and has antioxidant. It can be used year-round by persons of all constitutions, especially Vata and Pitta. Indian Ayurvedic doctors, use it combined with other specific herbs for several types of cancer patients undergoing radiation or chemotherapies. Strengthens the teeth and gums. Gulkand is an effective skin tonic which both clarifies and tonifies. It can act as natural deodorant when used regularly. When it comes to enriching the taste, there are very few alternatives available to our tasteful and exclusive variety of gulkand. Our exquisite range of gulkand showcases substance & flawlessness in optimum manner possible. The base which makes our collection unique lies in our approach where attention is paid to each and every possible aspect. Small Plastic Jar - Available in 800 Gms and 400 Gms Jar.